In this week’s episode Trebbe Johnson speaks with Joanna about: feeling the grief for the loss of the places we love; finding and giving back beauty in the wounded places of Earth; the resilience and creativity of Nature; the Global Earth Exchange; acceptance and creative change; the joy of acting together for the planet; guerrilla beauty; taking the right action as if your whole life depends on it; holding joy and grief in our hands. 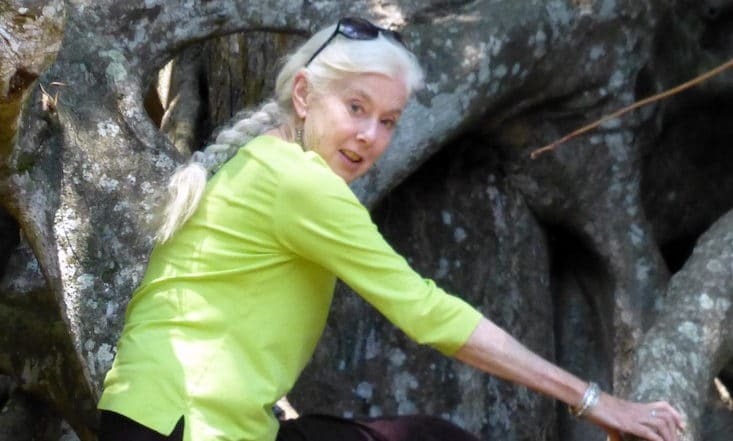 Trebbe Johnson, founder and Director of Radical Joy for Hard Times, a global network devoted to finding beauty in wounded places, leads workshops and wilderness trips worldwide devoted to the discovery of wisdom and insight in nature. She is the author of “The World is a Waiting Lover“, “101 Ways to make Guerrilla Beauty” and her newest book “Radical Joy for Hard Time“.